A bachelor auction, a hot football player, and the right woman to bring him to his knees. Izzy Knight walked away from her father’s billions and his Titans football team to become a nurse practitioner at a children’s hospital. She’s busy and accomplished and certainly has no room in her life for a larger-than-life football player who goes through women faster than she completes a shift at the hospital. Xavier Newton loves football but hates the games that go along with it. When the owner of the Titans forces him and his buddies to be sold like cattle at a bachelor auction he barely endures the event, until a feisty brunette bids half a million dollars for him. He’s completely drawn to Izzy, but when he finds out her father is the owner of the Titans sparks fly and everybody’s loyalties are challenged. Can these two find love when they don’t know who’s waiting to tackle them from the blindside? Oh yeah, I'm super excited about this new book by Cami Checketts! I mean, come on. A hunky football player who loves his mama, donates time and money to orphanages and did I mention he is hunky? Oh. I did. Xavier also has a tendency to get slapped. Quite a lot. I'm not sure if that says something about him or the girl that is doing the slapping. In my most humble opinion, I think it says more about the girl doing the slapping. Izzy has some issues. Mostly daddy issues which leads to relationship issues. Izzy is afraid and fear will always hold you back. Xavier is in a constant state of proving himself but he is pretty much fearless. I love his confident attitude and his generous spirit. He was the rock star of the story for sure. And come one! He's HUNKY! Sparks fly from the very first interaction between Izzy and Xavier and they never stop. Sparky, sparky. And I sure love sparky! There is a bit of danger thrown in too. It might just surprise you! 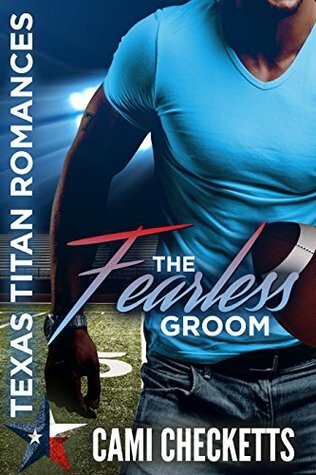 So, if you are in the mood for some sparky romance with a hunky football star, this is your book today! I picked this book up on Kindle Unlimited! some mild peril...lol This sounds good. Glad you enjoyed it.